A MILITARY-THEMED summer activity scheme in Woodbridge, Suffolk, has brought young people together to develop new skills. 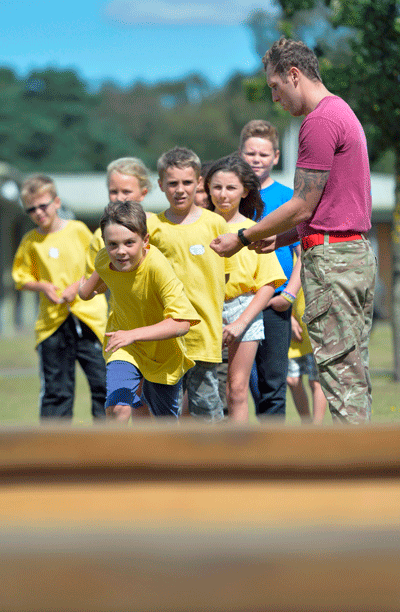 Operation Camouflage has seen more than 70 young people, half from military families based at Colchester, Wattisham and Woodbridge, take part in three action-packed days of craft and sport activities at the town’s Rock Barracks. The aim of the programme, organised by Suffolk Coastal District Council and the Army Welfare Service (AWS), is to bring together young people from different backgrounds to challenge themselves and develop new skills. 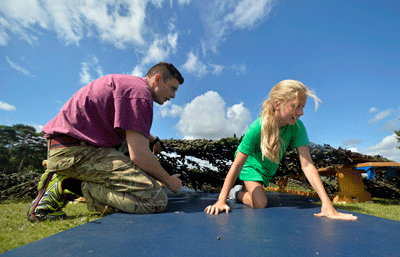 Activities ranged from graffiti art and T-shirt making to an assault course and bushcraft lessons run by soldiers from the town’s 23 Engineer Regiment (Air Assault). Young people also enjoyed sports including handball and rounders. AWS community development worker Claire Lowe said: “Operation Camouflage is all about the mixture – we mix young people from military and civilian backgrounds together for a varied mix of craft and sporting activities. This year the project secured funding from the Suffolk Armed Forces Community Covenant, which was signed in 2012 as a statement of mutual support between the county’s civilian community and its Armed Forces. Suffolk Coastal’s active communities officer Sarah Shinnie said: “This is Operation Camouflage’s seventh year and it’s gone from strength to strength. Some of the young people here have come from difficult backgrounds and it’s a great way to positively engage with them in a relaxed and enjoyable atmosphere. “Securing the Community Covenant funding has helped us be that bit more ambitious in our activities this year. Among the young people taking part was Solomon Jacobs. Having been a participant for the previous six years, this year the 14-year-old from Woodbridge was helping to organise activities.